Food menu programs for seniors should be designed with hydration in mind. As we age, our bodies become less able to conserve water and our sense of thirst diminishes. Chronic illnesses, including diabetes and dementia, and well as many medications, can make these problems worse. Because older adults face a greater risk for dehydration, senior care centers must find ways to increase fluid intake. Here are six of our top food menu program tips to help keep your senior residents hydrated. How easy is it for your residents to get a quick drink? Sometimes keeping water nearby – and visible – is enough to encourage older residents to drink more. Try keeping lightweight pitchers or small bottles of chilled water in common areas where residents like to gather and chat. Not everyone enjoys the taste of plain water. So, why not include some flavored varieties in your food program? Fruit-infused water has a subtly sweet flavor that many seniors appreciate. Stir in some frozen berries, citrus wedges, cucumber slices or melon chunks, for example, and you may find your residents drinking more. 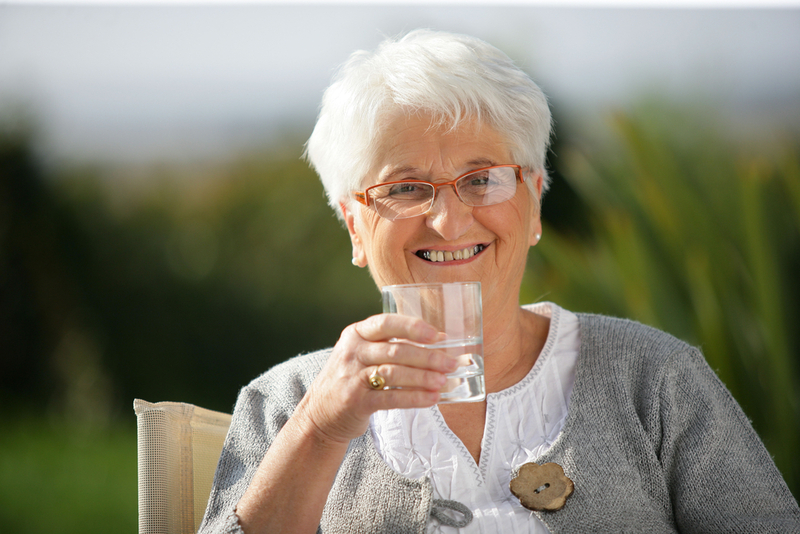 Drinking more water – flavored or not – will help seniors stay hydrated. But older adults don’t have to stick to just water. Include other healthy beverages in your food menu program. Low-fat milk, 100% fruit juice, coffee and tea are all good choices for boosting hydration. Fruit smoothies are another well-liked, nutritious beverage to consider. Beverages don’t always need to be sweet to be appealing. Many older adults like savory broths, and drinking low-sodium soup broth can be hydrating. To encourage seniors to drink more liquids, include chicken, beef and vegetable broths part of your food menu program. For many older adults, beverage temperature matters. And, if you can achieve the temperature they like, they will drink more. For example, some seniors may love iced coffee, but strongly dislike the hot version – or vice versa. The same goes for tea, juice and healthy drinks. Experiment with how you serve your beverages to learn their preferences, and dehydration may become less of a problem. Keep the season in mind too, as taste and temperature preferences can shift with the weather. Beverages aren’t the only sources of fluids. For effectively increasing hydration, many raw fruits and vegetables are effective. For snacks, try serving small plates of sliced cucumbers and bell pepper strips with a yogurt-based dip, bowls of cantaloupe and melon chunks or bunches of grapes, for example. Or, make a fruit salad with sliced apples, orange segments and blueberries. Would you like more assistance planning a healthy, hydrating food program for your senior care center? Grove Menus offers a cost-effective, easy-to-use meal planning system designed to meet the challenging health and dietary needs of older adults. For a free demonstration of our food menu program, contact us today. Copyright © 2015 GroveMenus. All rights reserved.